← How do Hormone Imbalances Make us Gain Weight ? Let’s Count the Ways! 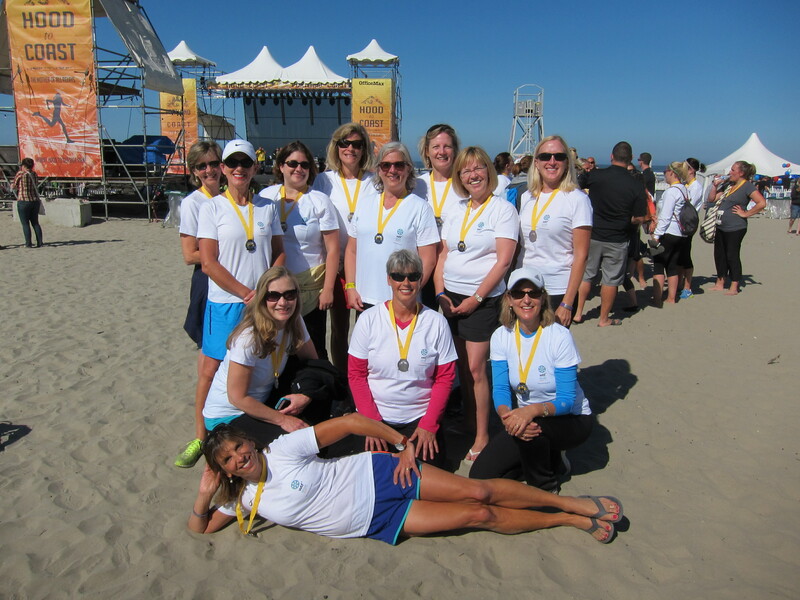 Summer is winding down but my Portland to Coast team is gearing up for our second year in “The Mother of Relays”. For those of you who have been faithful followers, you may remember some of my posts about our team’s adventures as a walking team. Hood to Coast has been around for over 35 years: it is a relay race starting at Mt Hood and ends at Seaside, OR. Over 1000 teams of 12 runners make their way over almost 200 miles. In addition, there are over 400 teams of 12 walkers who wind their way from downtown Portland to the Oregon coastal town of Seaside. This is one crazy but fun event! It is hard to imagine how it works but basically a village of runners and walkers travel between 130 and 200 miles in a relay race, complete with vans, headlamps(yes, we travel into the night!) , hundreds of volunteers, vehicle exchange posts, sleeping fields: quite the endeavor. At the end, there is a huge finish line along the Pacific Ocean’s edge, complete with vendors, food booths and a live band: the party goes on for hours, tired participants dancing until they literally drop in the sand and crawl into bed for a well-deserved sleep. Two weekends ago , most of our team members as well as some of our friends from afar, joined together for a mini-retreat up on Mt Hood . 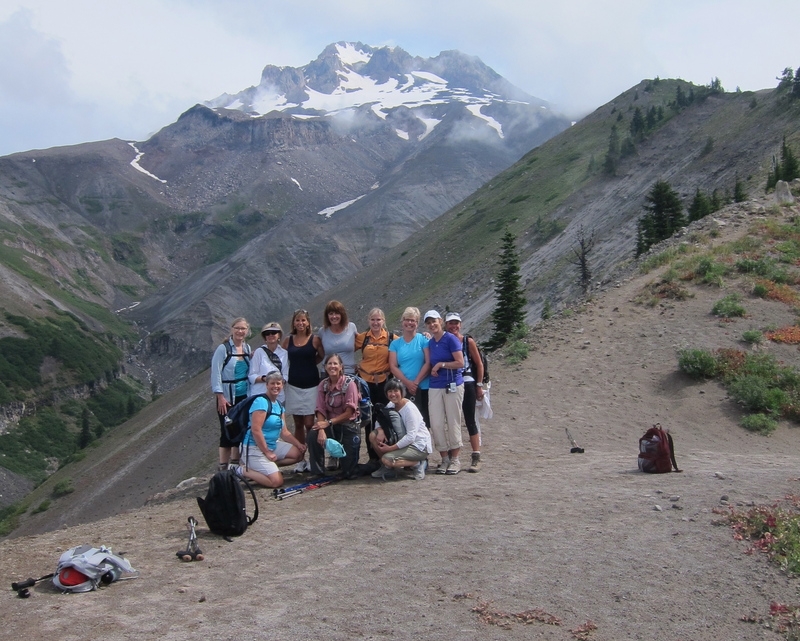 This originally started out as a team-building event, spearheaded by Karen(one of our teammates) who discovered an awesome opportunity for such a gathering at Silcox Hut, built on Mt Hood in 1939. This dwelling rests at about 8000 feet and has hosted many large groups over the years. It took quite a bit of planning to organize this group and this weekend, but honestly, it was well worth it. 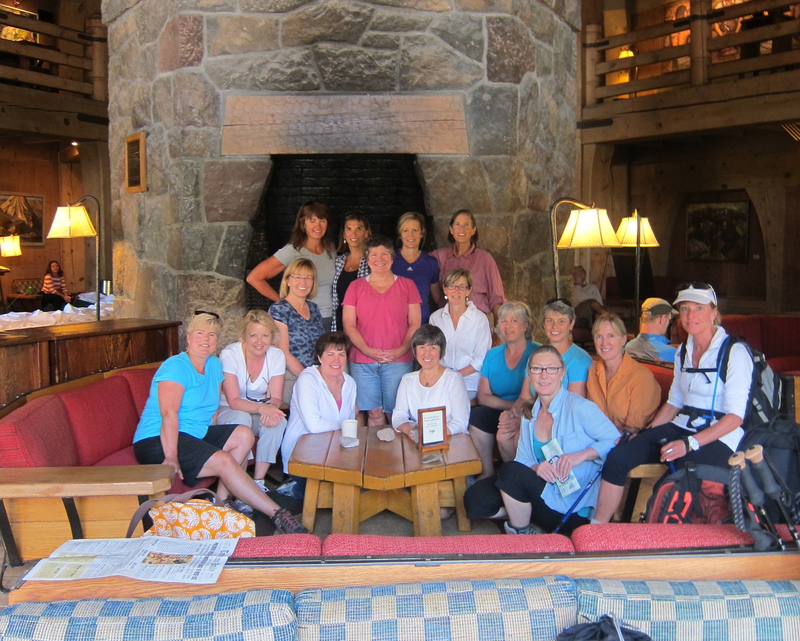 After we all made our introductions in the great room of Timberline Lodge(famously filmed in the movie, The Shining), 18 of us split into various hiking groups and headed off in various directions. 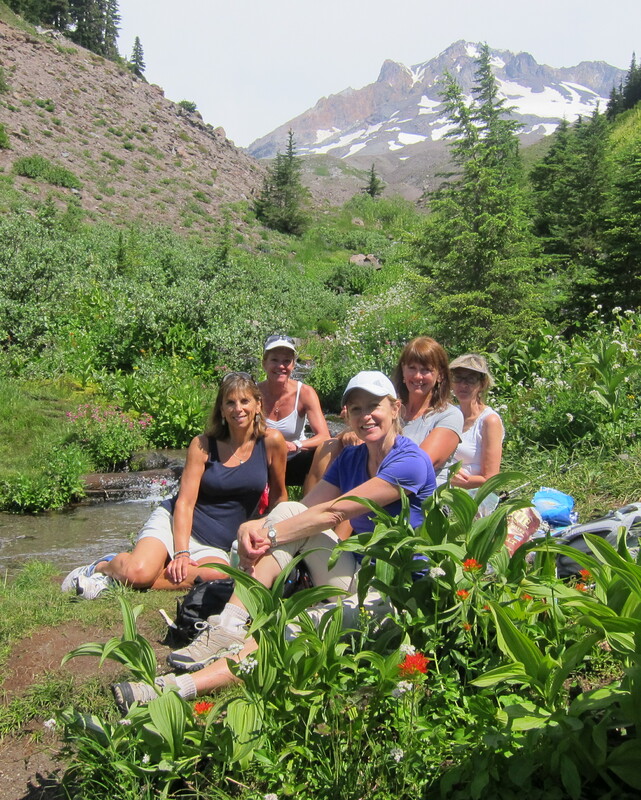 I ended up in a small group of women, five of us in all, who hiked together for over 10 miles up and down through Zig Zag Canyon(aptly named) and on up to Paradise Park. We finally settled down for lunch by an idyllic mountain stream surrounded by carpets of wildflowers and capped by the peak of Mt Hood in the background. It truly felt as though we had landed in Paradise: this particular hike may be the most beautiful one I have ever done. By late afternoon, after we enjoyed a quick dip in the hot tub at the lodge, we all wound our way back up to ‘the hut’, either by hiking , taking the skilift or enjoying a very bumpy ride in the host’s Suburban up the rutted road. The host welcomed us with wine, cheese platters, a roaring fire in the stone fireplace(yes , even in summer a fire feels great atop a mountain) and candle votives on the stone steps. This was truly a feast for the eyes and sore, tired legs. We spent the evening talking with old friends, making new ones , while we enjoyed a lovely meal prepared by our host. After dinner, we sat at the large banquet table, sipping wine, eating chocolate, playing games….reveling in the experience of 18 women gathered together in a magical place. When I think of the things that have helped me to maintain balance throughout the years, one that always comes to mind is the importance of my friendships and connections with other women. As women, we often get caught up in the ‘caregiver’ role of many: our families, our work, our communities , etc. Although these all have their rewards, it is equally important to nurture relationships with other women. My life is so much richer because of the friendships that I have with the many women in my life whom I consider to be friends. Make sure that you carve out time with the women that you love. Your life will be fuller and more balanced if you do. Wish us luck as we head off for another year of craziness this Friday, as we jump into our vans and walk together as a team. It’s a bit nutty, this whole thing, but I wouldn’t have it any other way. Happy trails! Thanks Mary….all positive thoughts greatly appreciated.